The last time Julie from A Cracked Bat sent a trade package, there was so much to cover that I had to split it up into two parts, Topps and Not Topps. Her latest trade was similar, in that there was a wealth of great cards to pick from, but this time I decided to split it up into Shiny and Not Shiny, another great way to create a two-part post that I've used before. There is a lot of ground to cover, including sets I've never seen before. We're going to need to ease into it with some borderless 2018 Chrome, because by the end, you may be seeing stars. German Marquez' base Chrome card doesn't go too over the top, it just whets your appetite a bit for what's to come. I haven't collected many of the 2018 sets, including Chrome. 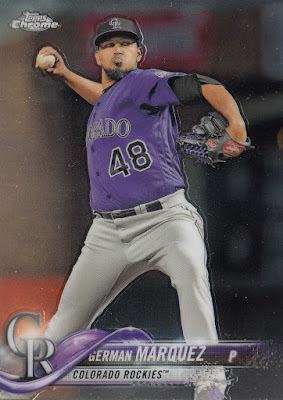 That's probably why relative newcomer German Marquez is pretty under-represented in my collection outside of Topps Now. 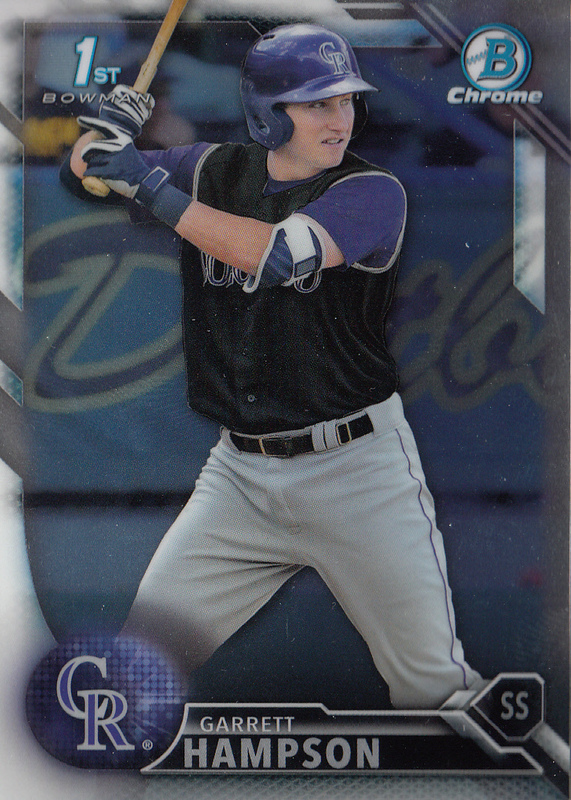 He has cemented a solid spot in a talented Rockies rotation, even doing so well in 2017 as to earn a comparison to 2002 Rookie of the Year Jason Jennings on the back of this card. 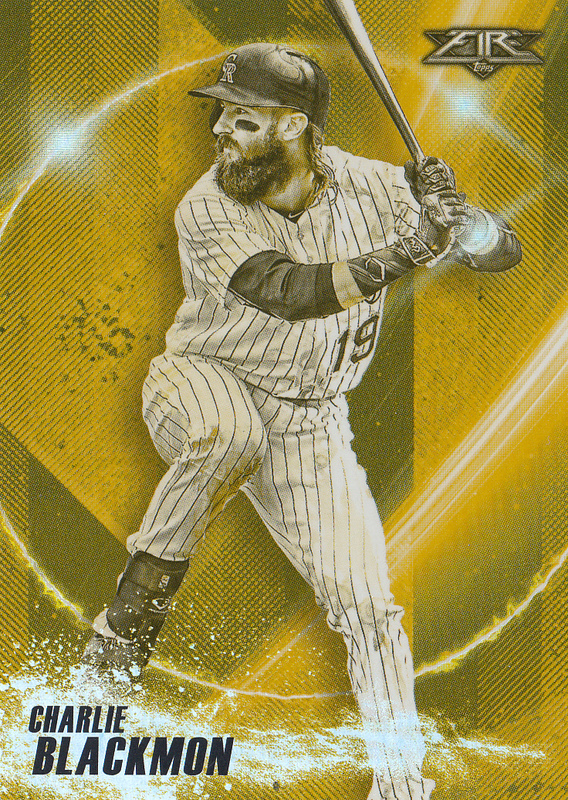 The waterslide design element pops just a little bit extra when given the Chrome treatment, and for now, this is one of the newest Topps cards around, since I have not yet purchased any of the newly-released 2019 cards. My side table is crowded enough as it is, with lots more trades, an incoming group break, part 2 of this one, as well as two entire blasters unwritten-about, 2018 Opening Day and 2018 First Pitch. Those posts will come in time, with about a 20 percent chance of Marquez being on the hill the day I post. 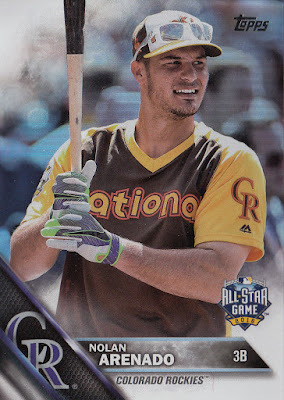 I knew this Arenado card from the 2016 All Star Game in San Diego looked familiar. The base version arrived a couple years ago from cards as i see them, but Julie graciously added this rainbow foil version to my collection. The retro Padres colors don't look any more retro, but the background and thin bars surrounding Nolan Arenado's nameplate clearly differentiate it from the base card under the right light. Night Owl's much-hated smoke area in the upper left remains almost untouched by the effect. The rainbow shininess trails off in that area on a gradient. What I know for sure is that the "CR" Rockies logo looks really weird on mustard yellow. 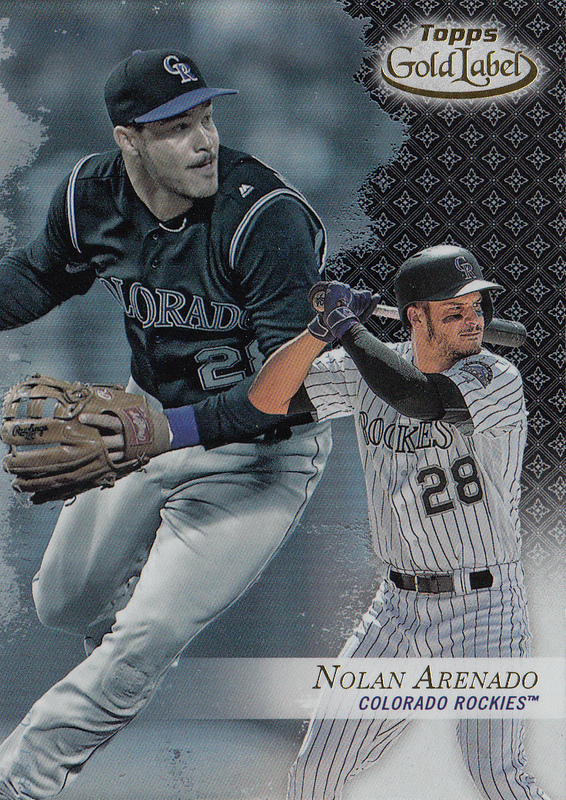 Julie clearly knows I like Nolan Arenado, so she added one in from 2017 Topps Gold Label. This one eluded me in Nachos Grande's First Rockin' Retro group break. It's a Class 1 card, meaning that the primary photo of the star third baseman shows him doing what he does best, and that's fielding. This card says nothing about his string of consecutive Gold Gloves, which is now up to six, but it does tell us about his consecutive 40-homer, 130-RBI seasons by the young age of 26. The only other players to accomplish that, we're told, were Chuck Klein and Jimmie Foxx, way back in the 1930s. The photo shows him standing up, but it still could be a highlight-reel play. Just not the ones where he's thrown out runners from his knees in foul territory, often by several steps. 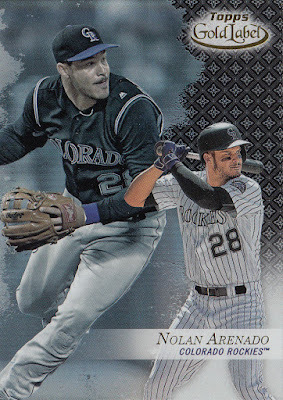 All three of the Rockies from the earlier group break had white backgrounds on the right side, but Sonny Gray, then of the A's, had a black area instead, just like Nolan's card. Apparently, this is a Black parallel, which led me to go back and revise the caption on Gray's card from a few months ago. I honestly did not put that together until after I scanned the cards for this post, because who knows with fractured sets? While that revelation settles in, we'll shift to another Rockies star, Charlie Blackmon. 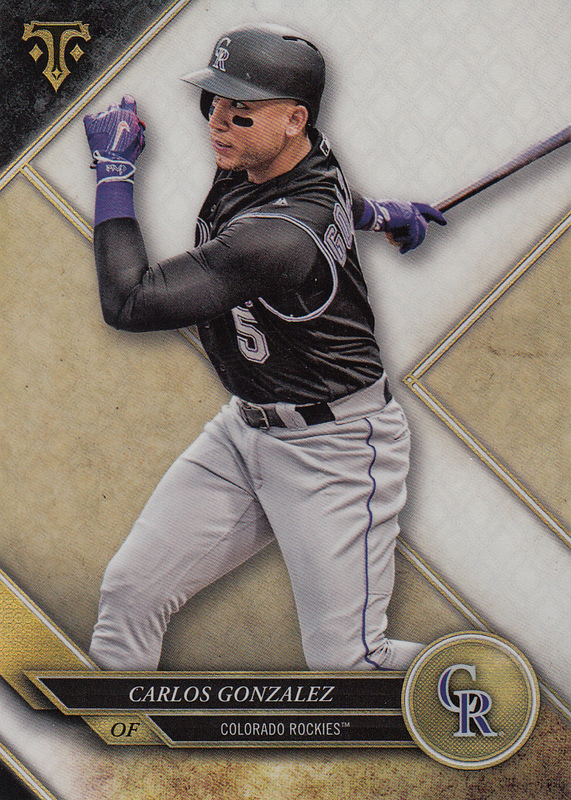 Bowman Platinum is something I haven't seen in a while, and that's further reinforced by it being found only in Wal-Mart these days. Topps took a weird direction with this set. It is a rainbow foil card, although I'm used to lots more shininess with this brand. I like the black border on the right, but this giant pastel-colored swoop thing completely dominates the design. It took multiple looks at this card before I even realized the photo's background is still there, as you can see someone standing on the top step of the dugout. This set may be too niche to earn its own nickname, but it looks a lot like light trails on a long-exposure photograph. That, or a scene from Speed Racer. And yes, the swoop is on the back too. From what little I've seen of Topps Fire, there's a lot less actual depiction of fire than numerous sets have used over the years. Even though it's been on the market for two years, this is the first time it's entered my collection. I don't really have an excuse on why I haven't bought any, since this is a Target exclusive. And it's just the sort of thing that seems to unintentionally wind up in your shopping cart when all you needed was mayonnaise. This yellowish-gold insert parallel is actually from the 2018 release, but Julie also threw in some 2017, which we'll see in part 2. This design doesn't really scream out to me; maybe that's why I haven't sought it out in two years. 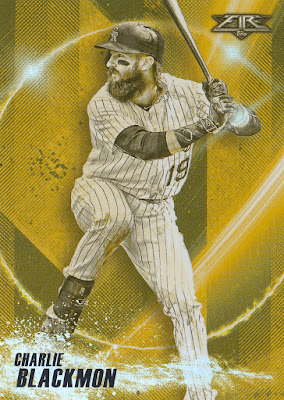 Like his Bowman Platinum card, it's also rainbow foil, but this shade of yellow is a massive distraction from that. Julie also threw in the Blue Chip variety, but this one of course caught my eye. Picture a slightly lighter shade of the Topps Bunt blue parallels and you'll get the idea. I'm not sure where Beckett came up with its listing for this set, which I'm not using in the caption. The card number begins with "PP", consistent with the "Power Producers" name I found in a few places. Beckett declares this and its three colored varieties is part of the "Golden Sledgehammer" insert set. Granted, that is a pretty awesome name, but doesn't seem to match anything about this card. 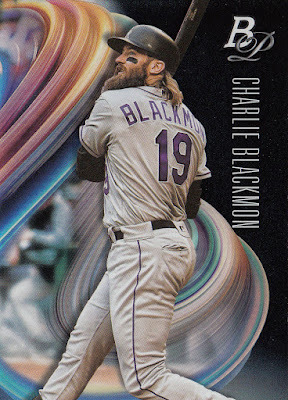 Whatever its true name, the card back mentions Blackmon's 477-foot home run on July 9th, 2017. As is often my luck, I was at the game a day before. But what this card doesn't mention is that it happened on the same day as Kyle Freeland came within two outs of pitching a no-hitter. Freeland was [puts on sunglasses] on fire that day. That's to reinforce the pun, but we might really need those sunglasses soon. 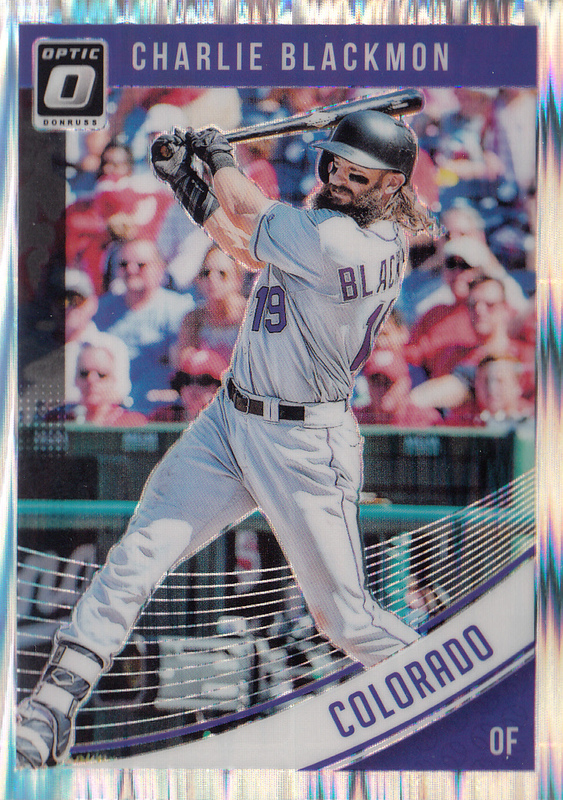 Donruss Optic is still going strong in 2018, and they're even starting to get fancy with their shiny parallels. I am pretty sure this is the Shock parallel, but I am even less an expert in Donruss Optic than Topps Gold Label, so feel free to correct me. It's actually pretty mesmerizing, because there appear to be shiny dots that move around when you tilt the card. And unbelievably, it scanned pretty accurately. This design with hints of 1984 Donruss appears to show the center fielder playing in St. Louis. That's my best guess, since it looks like there's just a tiny bit of the Cardinals logo painted on the back wall of the dugout. It might be a logo that Panini missed, though they did a fine job on Blackmon's uniform. He had a great year in 2017, becoming the first player to lead the Majors in hits, runs, triples, and total bases in the same year. To put a feather in that cap, he also won the batting title. Optic was a little bit more in check the prior year as far as parallels go, and that year the set used the familiar upward-sloping design that appears to carry behind the photograph. This year's design is most like 1991 in that regard, and the 1986 design used a similar angle but narrower lines. Panini has a wealth of designs to use if they keep this brand active in the future. It's only a matter of time before we see little baseball bats at the bottom facing right one year, then left the next. Or is it left, then right? I can never remember. Raimel Tapia got the Rated Rookie treatment in 2017, and the card back describes his first career hit on September 2, 2016, his first of ten that season at the young age of 22. If a picture is worth a thousand words, then a video must be many times that, but Panini did a pretty good job describing that highlight in less than a hundred. They even put the right name to the card, something the broadcast crew flubbed at first. With the departure of DJ LeMahieu, Garrett Hampson may be in line for some more playing time in 2019, depending on where Daniel Murphy appears on the defensive chart. He's a promising rookie, although he drew the short straw when the Rockies acquired Matt Holliday in late 2018. They sent him down to make room for the fan favorite's return, but called him right back up once rosters expanded in September, and even kept him on the roster for the Postseason. In fact, he scored one of just two runs the Rockies managed to plate during the entire 2018 NLDS. At this point in his career, he's a perfect Bowman guy, but he just got his first real Rookie Card in 2019 Topps Series 1. Bowman's scouting report on this Chrome Draft card is that he's a "scrappy competitor" who can "leg out infield hits". That may be, but his first MLB hit was a towering RBI double off the wall in Arizona. That didn't miss being a home run by much, and Topps already mentioned the hit on his 2019 card. Incidentally, his name came up during a recent conversation I had with Big Shep's Cards, whose friend's cousin is Garrett Hampson. 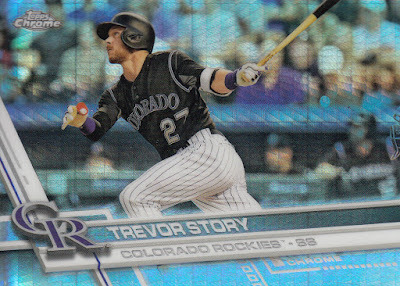 Clearly, Julie has tapped a rich vein of 2017 Chrome cards, because she sent me a slightly different version of this Trevor Story card last year. That was the regular refractor, this one is the slightly rarer Prism Refractor. The "spotlight" design on the normal refractors isn't used here, instead using lots of tiny facets in the background design, while at the same time allowing a clearer image of the dugout in the background. 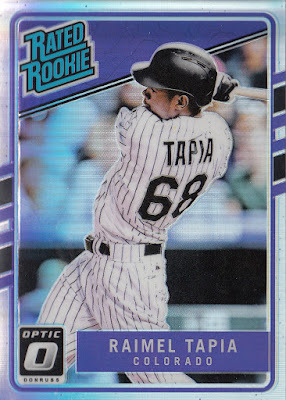 I spent some time last year gushing that Topps labeled the refractor as a refractor, but this one is missing that note. I guess it's obvious enough that it doesn't need to be differentiated from the normal chrome card. I don't think I noticed the "Chrome" lettering in the banner before, which is a little redundant with the usual Topps Chrome logo. Like me, Topps isn't above using puns. 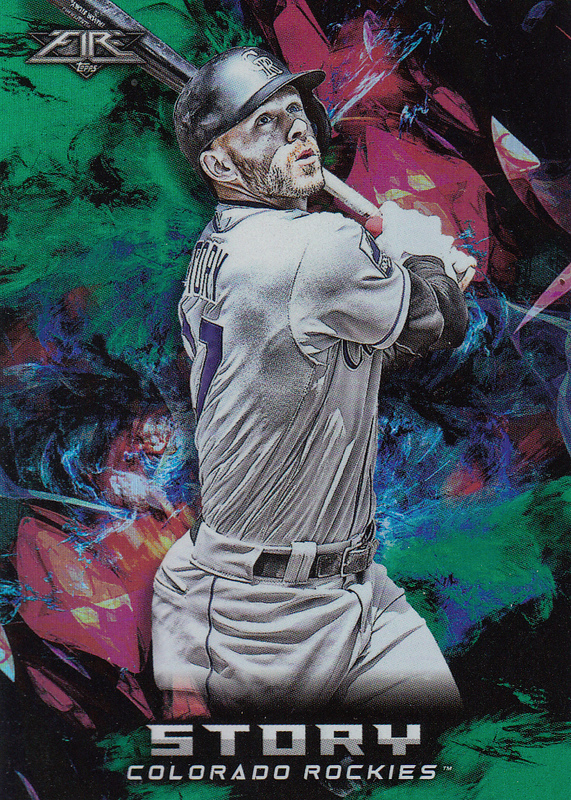 The card back on this trippy 2017 Topps Fire parallel tells us that "Story was en fuego" at the beginning of the 2016 season, having hit seven home runs by the time his career was six games old. What we're looking at here is the green parallel, and I guess green is the dominant color here, but red is really giving it a run for its money. As are numerous other colors. This wouldn't be out of place in 1995 Fleer, and is probably the closest thing yet to what we'd see if Jackson Pollock designed a baseball card. There's a /199 serial number on the back, which is also the only place we see Trevor's first name. We're going to take a little break from the contemporary art of Topps Fire parallels and return to a more traditional design with clean lines. Julie has sent me Triple Threads cards of Carlos Gonzalez before, too. I have no idea where she gets all these, but I'm glad she's on my side. Despite endless trade rumors, Carlos Gonzalez reached free agency after his time with the Rockies, and with the cold state of free agent signings, his place for 2019 has yet to be determined. I'd love to see him return to right field at 20th and Blake, (well, right field is more like 22nd), but the free agent market is weird right now. Things are also weird in his home country of Venezuela right now, although he resides in this beautiful home in Orlando. We're about to leave the modern era and return to the Blake Street Bomber era. If anything, the cards are just going to get stranger. I almost forgot about die-cuts. This one really isn't all that shiny compared to some others, but it has a pretty unique look. The background is blurred in a way that looks like a still from a rotoscope movie. You can still see the dugout and the first few rows of fans, but it's a different style of blur than you normally get from a camera. The die cut itself is fairly simple, although it reminds me that there are relatively few die-cut designs that are so symmetrical. 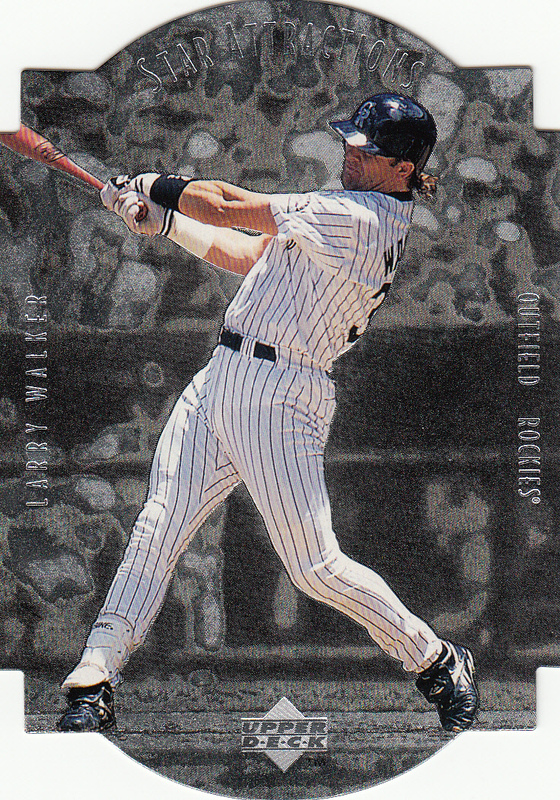 And the photo is cropped perfectly to contain Larry Walker, not omitting any of his batting stance and the power he's generating with his back leg. Most of Larry Walker's cards from this era mention his stellar MVP 1997 season, although Upper Deck lamented on this insert that "another season went by without a Triple Crown winner". He fell a little short on RBIs, and trailed in batting average to the great Tony Gwynn, but did manage to lead the NL in home runs. Studio was no different in 1998. They got a little more in-depth than the usual Triple Crown statistics, pointing out that Walker's .720 slugging percentage was fifth-best in NL history. That number was miles ahead of the AL leader Ken Griffey Jr. at .646, who took home that league's MVP. 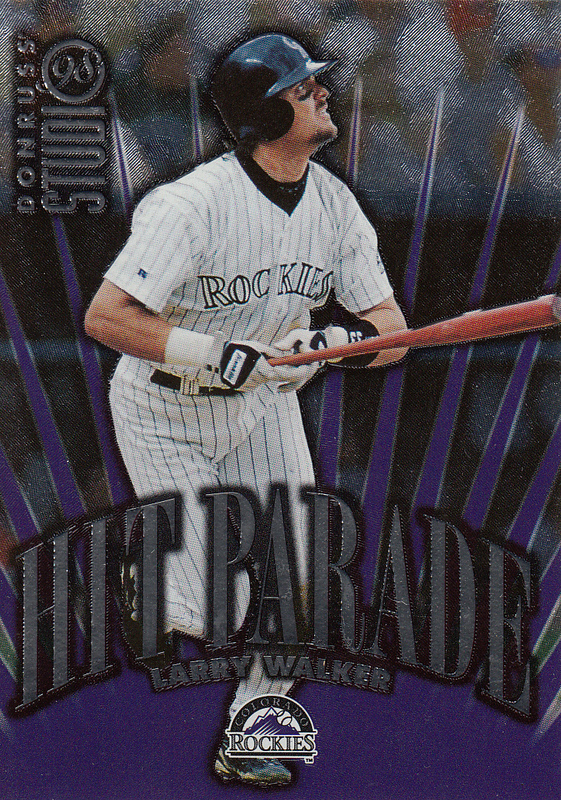 Sportflix and Studio both used Hit Parade as an insert set before Topps got around to it some time later, and Donruss even decided this one of Larry Walker was worth limiting to 5,000 copies. I am in possession of #3,886. The surface is what's known as etched foil, and up close, it basically looks like the ridges of a fingerprint. Our final card has a very similar etched surface, but lots more color. At first glance, I thought this was yet another mid-90s Stadium Club subset that eluded me all these years, but it's actually from 1996 Fleer Ultra. Those who collected 2014 Topps Power Players should find the colorful concentric circles on this similarly-named Power Plus insert set somewhat familiar. Baseball terminology has changed a bit over the years. The card back says that Larry Walker is a "strong two-way player", and then proceeds to tell us about his home runs and steals, as well as his outfield arm. That could be taken a couple ways, that he has both speed and power, or that he excels at both offense and defense. Today, of course, with the arrival of Shohei Ohtani, that term has evolved to mean players who can both hit and pitch, perhaps the two most divergent skills in the sport. Matt Davidson's name is coming up frequently in those discussions, and many scouts are looking for it in young players. 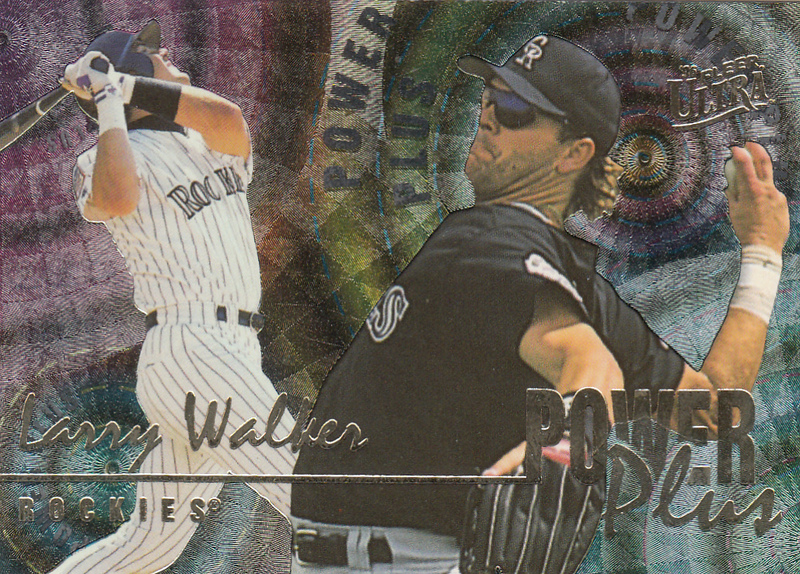 I could never see Larry Walker as a pitcher, but the two photo selections of this card give us a glimpse of what that might look like. Maybe, with a design like this, it's from a parallel universe where that did indeed happen. I always learn a lot from Julie's trade packages, and in part 2, there are still more sets that are making their debut in my collection. That 98 Studio Hit Parade insert is really nice. Takes me back twenty years. Thanks for being a great trade pal, always willing to take cards off my hands! Hit Parade and Power Plus were great foils in their day. They scanned nicely too! I'll have to look for more like that. This blog may be guiding my collection toward cards that scan well. 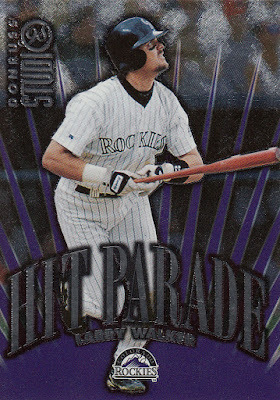 Love that Larry Walker hit parade card!